To earn the IIHS award, vehicles must get top marks in all five impact safety tests. 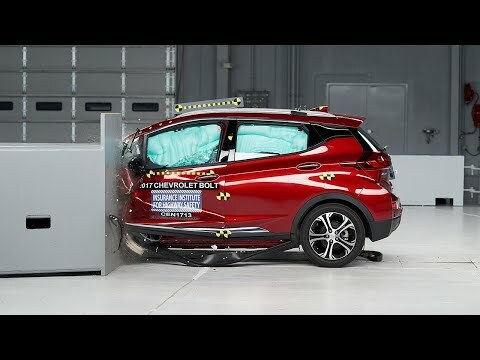 However, it is worth noting that the Bolt is a Top Safety Pick while the Tesla Model S is not, when the Tesla performed very well in most crash tests. This is because the Model S had difficulty at the small overlap front crash test. Here, the car hits a barrier with just the outside portion of the front bumper, concentrating the impact in just a small area. Thus, receiving an "acceptable" rating instead. Chevrolet Bolt has “low risk of any significant injuries” despite its size. Thanks to the fact that the vehicle lacks an internal combustion engine, enabling it to have a larger “crumple zone” up front. The results provided by IIHS will indeed boost sales of the Bolt EV. Last month, US sales of the all-electric vehicle increased by 1,566 units last month. But this figure is still far from the expected 25,000 to 30,000 deliveries they aim to reach. In 2011, the Nissan Leaf was the first EV that got that rating, except it lost the rating three years later, after the company made the requirements tougher. In the last three years, dozens of vehicles have been awarded with this distinction, but none had previously been given to fully electric cars. Today, the Chevrolet Bolt is the only full-electric vehicle to currently hold that award from the IIHS. However, the company has not tested Tesla's all-electric SUV yet. And if you didn't know, it recently became the first SUV to earn top five-star scores in all federal government safety tests. The Insurance Institute is a private auto safety group financed by the insurance industry. The company performs their own set of crash tests, which are different from the ones required by the federal government. The Chevrolet Bolt is the first all-electric vehicle to earn a 2017 award from the Insurance Institute for Highway Safety. The small car is new for the 2017 model year. Unlike the Chevrolet Volt, it has no back-up gas engine. The Bolt earns good ratings in all five of the Institute’s crashworthiness tests — small overlap front, moderate overlap front, side, roof strength and head restraints. It also has an optional front crash prevention system that earns a superior rating. The car avoided collisions in IIHS track tests at 12 mph and 25 mph, and the system has a forward collision warning component that meets National Highway Traffic Safety Administration criteria.